My blog seems to have fallen asleep.... Sorry about that!!! I had intentions of getting ahead this week but I was buried under Dirty Dozen projects, completing my samples for the upcoming TSG release and watering my parents' garden. I had hoped to do some "me" stamping this week but it didn't happen.... Hopefully next week!!! I know why you're here... you're here for the current iSpy sketch!! Yeah!!! This week's sketch is from Renee Matarese ( Renlymat @ SCS) and is based on this card. 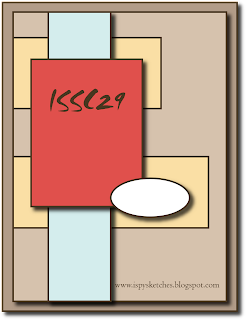 My card is also for this week's TSGA post. Each month at There She Goes we highlight some of our older sets and Jessica puts them on sale :-). 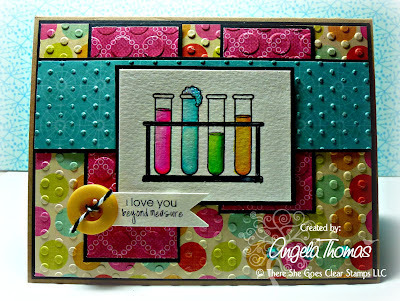 For my card, I've used the TSG set called "Chemistry". It has always been one of my favorite TSG sets and I pull it out every chance I get. I have watercolored the image with Tombow Markers and then added some Diamond Stickles to the "bubbles" coming out of one of the test tubes. Your terrific colour combo and colouring really caught my eye so I had to come over to see the rest of your work. I must say, I'm impressed. Will be back again. Angela, it was an honour to meet you this morning; really enjoyed our conversation. This card is gorgeous. Your colouring is spectacular. I'm going to try to enter the challenge this week.